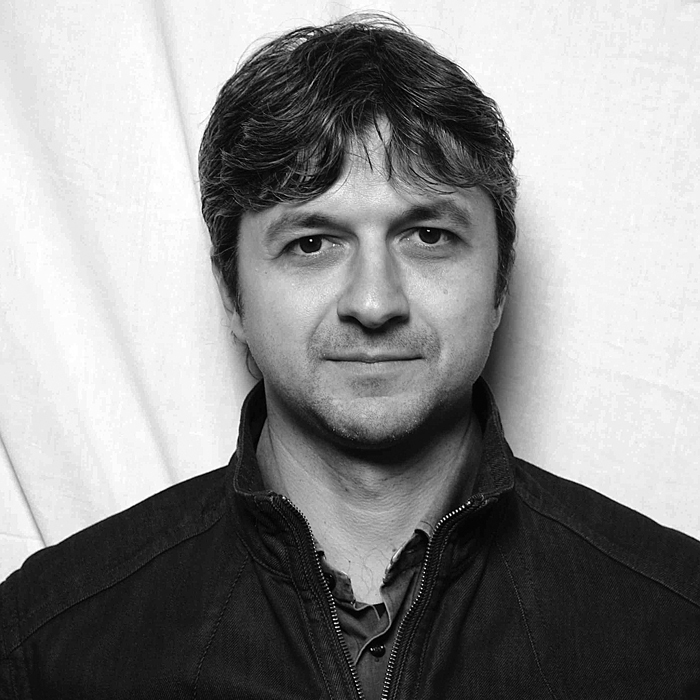 Croatian multimedia artist Igor Grubic has called attention to acts of political and social violence in his startling work for the past 10 years. 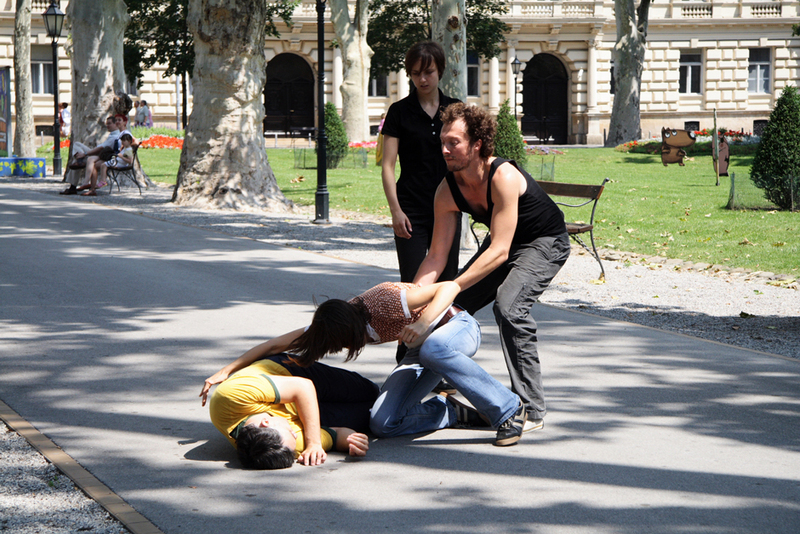 With works like Angels With Dirty Faces, 366 Liberation Rituals, and East Side Story—a video work addressing neo-Nazi attacks on particpants of gay pride marches in Belgrade and Zagreb in 2001 and 2002—Grubic has gained an international reputation as an artist willing to tackle heated issues with a powerfully wry touch. We caught up with him for the next installment of our Art Collection Telekom series. Video still courtesy of Art Collection Telekom. In your performance art series 366 Liberation Rituals, you documented a year of your life by doing a different act every day. That sounds like a performative diary. That’s right, it could be seen as a diary. But of course this diary only shows the actions and the performances, not my life. Yet, your actions say a lot about you. It’s the same with Jonas Mekas’ 365 Days Project, in which the Lithuanian filmmaker posted one video every day for a year. These diary-like films only show minutes or seconds of every day, but they act as historical documents. It all started with a series of site-specific works of mine. I liked them because they’re really challenging. You do these performances or actions on the street, and that means that you’re visible—and it also means that there’s a lot of adrenaline involved. I love the tension that you create when you do art in a public space, especially when it’s unannounced. You never know what’s going to happen. Most of the time, my actions are also illegal, in the sense that I should have asked for permission first. To do a site-specific intervention means that you have to study the context first. You have to know the history of a specific space or a monument, otherwise you can’t comment on it. But regarding 366 Liberation Rituals, the actions became a daily routine, in the best sense. They became a full-time activity for one year. You performed them over the course of the years 2008 and 2009. The starting point of 366 Liberation Rituals was, among other things, the 40th anniversary of the events of 1968. It is a series of everyday small rituals that deal with the problems of the society I live in. Prior to that, I went through a difficult period in my private life. In hindsight, it all seems like a domino effect; close relatives of mine became seriously ill, died, or ended up in jail; I got divorced; my life got turned upside down—and it didn’t seem to stop. At that point, I had already been preparing the project for some time. Basically, the events in my life pushed me to actually start it. Rituals can give a new meaning to life—that’s probably why many religions incorporate rituals. I was turning 40 that year, and so I was probably going through the so-called “mid-life crisis.” I wasn’t willing to accept the idea that turning 40 is supposed to reflect “seriousness”—professional achievement and material security. Through small rituals, I tried to liberate myself from routine habits, and from seeking security and conformity. In 2007, I even made the radical decision to quit my job as a film producer. I had worked as a film director and producer of documentary and animated films, and as an artist in the past. Between 2000 and 2007, I was part of a Zagreb-based social activist group called FADE IN, and I also produced socially-minded films that we sold to national television. I really worked a lot. But in the light of the events that happened in my family, I somehow lost control over the various projects I was involved in. I felt that, after many years of taking care for other people as a producer, for once I had to focus on myself. So I decided to dedicate the whole year 2008 to my art, and I forbade myself from doing other jobs at the same time. It was a decision to fight against my own despondency, lethargy, potential silencing. You mentioned religion—I would say that I needed something like a spiritual discipline that would help me to channel my emotions, to distract me from my personal pain. I returned again to meditation practice. I needed to go out into the public space to dispel the pain. A ritual is an act of catharsis, a struggle against personal and social lethargy—it’s as an act that calls for change. And besides that, it was a protest against the political situation and injustice. I have only seen 14 of your rituals—they’ll be part of the Fragile Sense of Hope exhibition in Berlin. What impressed me most was that they all must have needed a lot of preparation, as they are all quite complex. Well, I think a lot of people don’t realize that it was my full-time job for one year, even though the actions seem quite simple and minimalistic. I was working for at least eight hours a day, and I was never sure if I would be able to develop new ideas that would satisfy me for the next day. I needed to scout the locations, I needed to prepare and to buy things. I could rarely find an assistant for these actions—that’s why I had to do most of the documentations of my interventions in the public space myself. Why was it so difficult to find an assistant? As I said before, most of these actions were illegal. The adrenaline was great, but I could have gotten arrested at any time—and it did happen, once. Although the photographs of some actions do not seem disturbing, the interventions almost always generated a strong reaction from the public. There were shouts of approval, eggs were thrown at me, and real physical threats, all at the same time. There were priests who reacted, police would come, or security was called on the spot. Many photographers that were supposed to assist me gave up on the project. So, I basically did everything by myself. In one of your interventions, you “welcomed” former US president George W. Bush by coloring the water of the fountain in front of the National Bank of Croatia blood red. Are you referring to that one? Yes, that’s a good example. I did this intervention on the day of the Bush’s visit to Croatia, in front of the National Bank of Croatia, where the International Monetary Fund offices are situated. I colored the water of the fountain in red, to refer to the blood of the victims of Bush’s international policy. I succeeded with that intervention, despite the strong security measures and a large number of police officers on the streets. It was also a direct provocation to the atmosphere of emergency-like state in the country during Bush’s visit, the regulation of public space and citizens’ behavior, which starts with cleaning parks to welcome the American president and ends in neutralizing any attempt of expressing criticism and resistance. I suppose that you’ve documented that action yourself? That’s right. Since the photographer who was supposed to assist me ran away from the location, I had to come back and take some photos myself. But there were also actions where I was the protagonist. In these cases, I needed someone who would take photos during my performances. Documenting my work was vital. Only by documenting my performances, by having photographic evidence, would my diaristic approach later become visible, a potential art piece that would spread a message of a protest and resistance. And at the end of each day I would write a very small text that would explain the action of the day. You wore a worker’s outfit (such as blue overalls a technician might wear when he installs something) during many of your public demonstrations. Did you do that because people nearby wouldn’t become suspicious of you so easily? Yes, but that wasn’t the only reason I took on the identity of the worker in many of my actions. I also meant to pay respect to the workers. The awareness of the important role of the worker in building the socialist society was very present. My rituals are called “liberation rituals” for this reason. In Croatia, we don’t really have a culture of speaking or protesting freely in public—there was no protest culture in socialism. Speaking out against the government more or less meant that you’d become a public enemy. The culture of protest like you have it in the West wasn’t really known in Croatia, at least not until now. Today, we have protests against the economic crisis and against the politicians who robbed us in the process of turbo-capitalism. But my protest is different; I care for others when I do my actions, since it’s more a ritual tends to initiate a dialogue or communication in a creative way—not necessarily in a peaceful way, but in a mindful, well-intended, and creative way. Before embarking on your Liberation Rituals project, you made a film called East Side Story, which became quite famous. You filmed gay pride parades in Beograd and Zagreb in 2001 and 2002, and documented how nationalist hooligans and war veterans protested against it. It’s a painful experience to watch the video, because it shows hate and violence. The footage from Zagreb was filmed by the activist studio FADE IN that I was a part of, and I got the footage from Belgrade from the independent TV B92. The most disturbing thing is that in the beginning, most of the gays didn’t even dare to attend the demonstrations, because they were scared by the strong prejudice in our society. It was mostly activists from non-government human rights organizations who participated. On the other side, there were many war veterans who were identified with a very strong national identity, which is equivalent to the politics of the church, but also football hooligans who were just bloodthirsty. The church started to cooperate with the new right-wing political parties in the 90s, which spawned conservatism, traditionalism, and ignorance in our society. Did you intend to film the brutal clash of the two opposing ideologies the way it happened in East Side Story? No, I must admit that I had a completely different idea in mind when I actually started the project. At first, I wanted to do a documentary that consists of a series of interviews with protagonists from both sides about their motifs. I wanted to make them into a film. But witnessing the violent events made my plan pointless. The film footage was so much more meaningful and significant than any interview that I could have conducted. I mean, the footage is so depressing! You see Nazis beating up peaceful protesters to pieces. You don’t want to hear them “explaining” their reasons if you’ve seen the footage. I must admit that I was totally shocked by what I witnessed. I never had seen such an aggressive cruelty before in my life. Another piece of yours is called Angels With Dirty Faces, and the angels in your project are miners. The miners of Kolubara were the backbone of the Serbian economy, and produced more than fifty percent of the country’s energy demand. They began a strike in 2000 that eventually forced the Milošević government to retire. When I met these miners, I asked them about the movies they liked to watch and one of them mentioned Wim Wenders’ Wings of Desire. I realized that, to me, these miners were just like the angels in his film. Of course I know the Michael Curtis film of the same title, but Angels With Dirty Faces refers to the idea that these hard-working and honest miners actually had clean hands and a clear conscience, as opposed to the dirty-handed politicians and the governing bodies who commit violence in their greed for power. Why did you ask them about their favorite films rather than their favorite artists? I figured that they probably wouldn’t care about contemporary art, but that they probably watched all kinds of films—that’s why. And they started to talk about the most surrealistic movies! Many of them liked Kusturica. But then, as I said, one mentioned Wings of Desire, and since this film is one of the most important films that I’ve seen in my life, we immediately bonded. That’s why I portrayed the miners with wings that I had painted on the wall. In socialist times, you’d read portraits of workers in the newspapers, or you’d see films about them on the national television. They were paid with respect, but this respect disappeared after the fall of socialism in the beginning of the nineties. Since then, stories about the rich and the famous have taken their places. While politicians have turned into pop stars, workers and miners have basically disappeared in the media. In one of my 366 Liberation Rituals performances, I painted my hands black and left my black handprint on the veneer of the Croatian parliament in Zagreb. I wanted to show solidarity with these workers and that their hands aren’t dirty. Of course, I wore a worker’s garment during this intervention. Which other directors do you admire? I have to mention Andrey Tarkovsky first, and I say this from the perspective of someone who wanted in the past to become a film director, but somehow deviated. In my formative adolescent years, I watched almost every film by Fassbinder, Fellini, Bergmann, Rossellini, Godard, Buñuel and Antonioni, but somehow, Tarkovsky left a stronger impression on me than all of the others. It probably has to do with the fact that in 1991, I faced the beginning of the war in Croatia, the closeness of death, and cruelty. This was a shocking experience for me that led to a personal crisis of identity, almost like in Stalker. My own spiritual research and spiritual revolution started, some kind of struggle that lasts until now because it demands attentive self-observation every day. I started to become interested in spirituality as a result of the war and my philosophical studies. As you said, rituals are a big narrative in spirituality, and rituals are an important reoccurring element in Tarkovsky’s films. And not only that—his films are meditative films. A ritual is nothing else than a meditation that helps us to come closer to ourselves. In his film Sacrifice, there’s a story about a monk and how he gives water to a dried out tree that eventually comes back to life. If everyone would behave like that and do something similar in his life, this would have an indirect impact to the collective conscious that could bring some kind of a change in the world for the better. Click here to read more interviews in the ACT series.